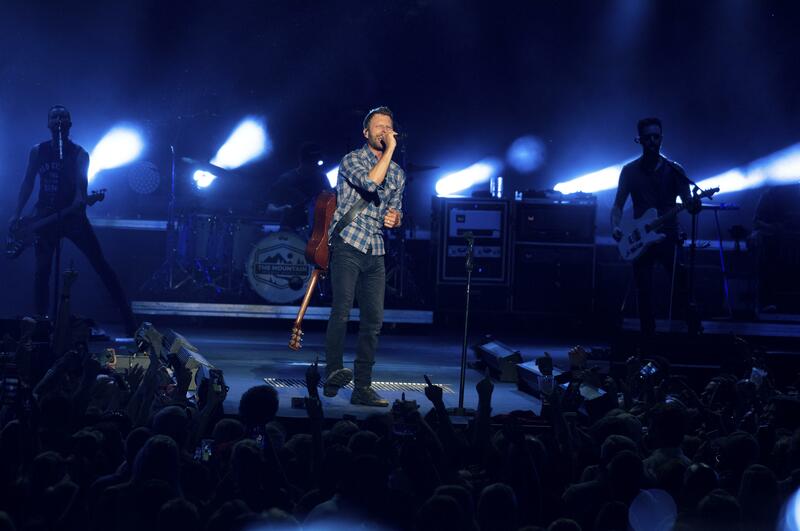 Dierks Bentley reviewed Thursday at the Spokane Arena. Thursday night’s show at the Spokane Veterans Arena marked the first U.S. stop on Dierks Bentley’s 2019 Burning Man tour – and what a show it was. Lights up to lights out spanned nearly four hours of solid country entertainment. Bentley had promised a balance of humor and heart in his setlist, and the evening delivered. First up, the Hot Country Knights, Bentley’s notorious ’90s covers band grabbed the audience’s attention with wild wigs, bandanas, problem pattern button-ups and, of course, a few Dierks Bentley and Shania Twain covers. The set was equal parts comedy and country music, and neither did anything to detract from the other. The comic banter among the band members was a show in itself; if you want a good laugh, check out the band’s bio on Facebook. Next up, no one was sure what to make of up-and-comer Tenille Townes when she took the stage. “This is my very first arena tour,” Townes said. But when she started to sing many in the audience fell in love. Her easily recognizable vocals and folk style quickly won people over and when she left the stage after performing several covers and a few originals, she was missed. The backup band and arena setting did her acoustic music a real service, lending it an exciting new weight that some previous arrangements and recordings have not. In the beginning, she may have sent a few patrons to Google but, after the show she had put on, those searches changed from who she was to where they could buy her music. At one point during a break in the set you could hear someone yell “my wife loves you!” and judging from the audience’s reaction, the sentiment was widespread. After a half hour intermission, the DJ, whose name I couldn’t quite catch, started hyping the crowd up in earnest, “Spokane, you’re the best crowd ever – I swear!” he shouted. The stage was set, and the crowd was going wild. Red lights and traveling spots draped the stage as Dierks Bentley finally appeared. Desert scenes and volcanic landscapes served as a backdrop for the opening beats and chords of “Burning Man.” Moving straight into “Up On the Ridge” the screens switched to dramatic images of the outer universe. At one moment, a series of light strips lowered from the ceiling while an image of the moon appeared to fall toward the stage. The effect was powerful, drawing quite a few oo’s and ah’s from the crowd. Then in “Somewhere on a Beach” the mountain display from the previous set up melted and morphed into a wave that appeared to rush out from the stage. “You like that Spokane?” Bentley asked. The answer was clear. Bentley’s stage presence is something to marvel at. He has a natural charisma and a refreshingly diverse physical vocabulary that emphasizes and corresponds to his lyrics. He’s always confident; at one point after an unusually long round of screams and applause, he said “Wow, I could do no wrong up here. I could sing the alphabet!” and he started to sing the alphabet. The crowd welcomed Townes and Pardi back to the stage for a few duets and, in a way, the Hot Country Knights had been there all along. Bentley closed the show with “Sideways.” But that wasn’t enough. Applause and screams of “encore” rang out. Bentley thanked the crowd and wished them well on their ways. “Spokane – hope you guys did some livin’ tonight!” Bentley said. Published: Feb. 1, 2019, 3:43 p.m. Updated: Feb. 1, 2019, 4:19 p.m.